Miami Music Project recently celebrated 10 years of incorporation as a non-profit organization in the State of Florida, launching us into our second decade of changing at-risk youth through the transformative power of music! Miami Music Project uses music as an instrument for social transformation, empowering children to acquire values and achieve their full potential, positively affecting their society through the study and performance of music. Help us reach our goal of raising $30,000 from 100 donors on Give Miami Day this year! We strive to create opportunity and access for those most in need, to develop creativity and innovation, and to improve the quality of life for children today and throughout their future. The past decade has allowed Miami Music Project to provide music to thousands of at-risk and underserved youth in our community. Miami Music Project has been recognized by the Miami-Dade County Public Schools School Board and the National Endowment of the Arts. It is the first program of its kind in Miami-Dade County and is proud to continue to expand its reach to more students in underserved communities. Miami Music Project uses music as an instrument for social transformation, empowering children to acquire values and achieve their full potential, positively affecting their society through the study and performance of music. MARCH 16, 2018 - Miami Music Project made its way to Washington DC to march alongside students of Marjory Stoneman Douglas High School in support of student-led activism. Made possible by generous donors Carol and Joe Reich, transportation and accommodations were provided for 38 young cultural ambassadors from Miami Music Project programs and iPrep High School. These efforts reinforce the importance of empowering our youth to make their voices heard. Miami Music Project’s tuition-free Summer Music Camp provides over 80 hours of intensive musical instruction and performance preparation for 170 students from at-risk demographics and disadvantaged communities across Miami-Dade County. 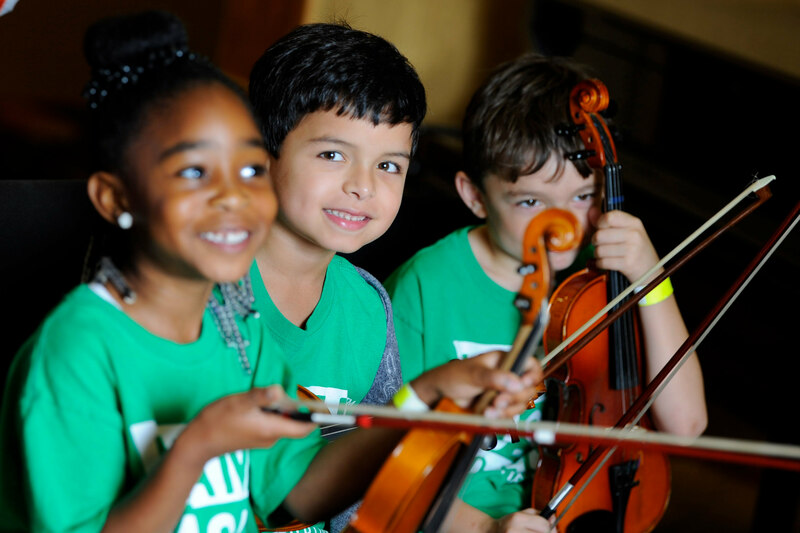 Miami Music Project trained Teaching Artists provide rigorous music lessons in orchestra, choir, music theory & social development activities daily for four weeks, providing 80 hours of summer camp programming. Campers will participate in 1 concert day field-trip in July at City of Miami’s Manuel Artime Theater. In addition to increasing musical skills, Miami Music Project’s El-Sistema inspired programming is shown by independent research studies to provide statistically significant enhancements of social and executive functioning skills to prepare them for academic and artistic achievement. Free transportation is provided. Free lunch is provided daily by Miami-Dade County Public Schools. Before and after care are provided for one hour prior and following programming to allow flexibility for working parents. Description: Taking place during selected teacher planning days and weekends, this provides intense training on challenging repertoire featuring special guests such as New World Symphony's Michael Tilson Thomas and unique opportunities such as the Universal Studios Orlando Sound Design Workshop. This opportunity helped prepare 46 of our students to attend the prestigious Interlochen Summer Arts Camp free-of-charge. Miami Music Project Teaching Artists receive workshops and coaching on select topics to prepare them for the upcoming year. This includes intense training with faculty and students to improve the ability to work together towards a musical goal. Teaching Artists receive formalized training in the following subjects. 1. Core program values; 2. Classroom training & management; 3. Resilience in at-risk children (including cultural adaptation); 4. Program curriculum; and 5. Making sure every student, regardless of their needs, receives the best attention to maximize their learning. Miami Music Project's programming has a ground-breaking structure that embeds Social-Emotional Learning into its curriculum leading to substantial improvement in participant's positive youth development. Our ensemble-based orchestral musical education programming promotes three critical features optimal for positive youth development programs: •	positive adult-youth relationships, •	activities that build skills, and •	opportunities for youth to utilize these skills in community activities. Independent research, conducted by FIU researchers, has already shown the profound effects Miami Music Project programs have on its constituents. The research findings provide robust evidence of Miami Music Project’s positive impact, consistent with its mission of enhancing social-emotional well-being, behavioral development, academic motivation, and achievement. Longitudinal assessments revealed statistically significant enhancements across a large variety of factors. Miami Music Project students benefit from being embedded in a holistic system that nurtures outcomes at multiple levels: •	individual (e.g., grit, hope, self-confidence, happiness), •	interpersonal (e.g., positive peer relationships, empathy, leadership, cooperation), •	familial (e.g., parents sense of hope for their own and their children’s future as well as their confidence as a parent), and •	community (e.g., successful concert performances hosted in local neighborhoods and city-wide). Co-Founder & President, Stratigraphic Asset Management, Inc.
President, Firestone Capital Management, Inc.
Senior Wealth Manager, Firestone Capital Management, Inc. Learn more about Miami Music Project Inc.